Description 6 Sections See flier/form. Onsite Registration: All players registering onsite will receive a bye in round 1. Onsite registration from 8:00 � 9:30am Teams: Top four finishers from the same school combine for team score in sections 1-4. Minimum two players per team. Pre-Registered: Pre-registered players must check-in before 9:00 am or will receive round 1 bye Schedule: Round 1 begins 9:00 am for sections 5-6 and 9:30 am for sections 1-4. Entry Fee: $15 for all players with NO ADDITIONAL MEMBERSHIP FEES REQUIRED Mail before or on February 2 Contact: Crystal Cruz can be contacted at normanchessclub@gmail.com or 405-863-4720 cell New this year: Chess Express Rating included. 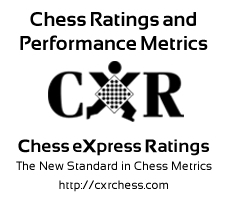 USCF rating included for Premier players.